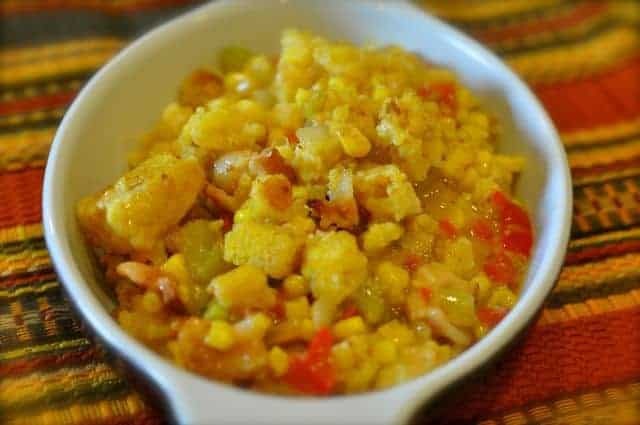 You can do something extra special with canned and creamed corn by adding bacon, onion, celery, and bell peppers to make this a terrific dish. Luby’s Spanish Indian Baked Corn is the perfect dish to bring to a pot luck dinner, because it reheats so easily. You can make Luby’s Spanish Indian Baked Corn at home. In a large skillet over medium heat, cook bacon until crisp. Add onion, celery and bell pepper and saute 2 minutes over low heat; set aside. In medium-size pan, melt 1/4 pound butter; add milk, corn, jalapenos, pimentos, salt and sugar; heat over low heat. Add bacon-vegetable mixture and 1 cup cornbread crumbs to corn mixture. Heat well, stirring frequently. Transfer to an 8x11 and 1/2-inch pan. Moisten remaining cornbread crumbs with remaining margarine and sprinkle on top of corn mixture. Bake at 350 degrees until crumbs are light brown. The first time I tried this recipe it was too watery, runny. I am glad it worked out for you the 2nd time. I tired this recipe! It taste better than it looks ! I don’t eat pork so I did not use the bacon!! This recipe looks so good I can’t wait to try it! I will need to omit the jalapenos for my family.